If you care about your outdoor living area, you may instinctively shy away from synthetic turf. When many people think of synthetic grass, they think of the neon green turf used on sports fields or other materials that don’t always hold up to close scrutiny. 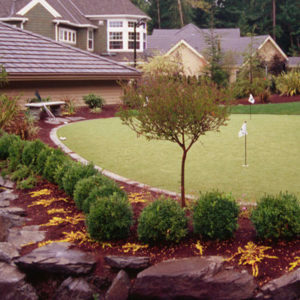 Our synthetic lawns could not be more different. Our landscape design uses synthetic materials that look and feel like real grass but only require a fraction of the maintenance and upkeep. Synthetic turf is a lawn covering made out of man-made materials rather than real grass. Turf comes in rolls, much as carpet does, and can be laid down on the lawn and secured in place. Some types of turf come with built-in drainage systems to keep water from pooling in the yard, or with layers of padding to make the turn more comfortable to the touch. Synthetic turf is more durable than regular grass and requires far less care. It doesn’t need to be watered, cut or seeded, so all you have to do is lay it down on your lawn and enjoy it. Synthetic grass has additional benefits in certain specific circumstances. For example, lawns and gardens that see heavy traffic – for example, children or pets playing – may no longer be able to grow lush green grass. In cases like these, synthetic turf can restore the look of your lawn. In addition, synthetic turf stays green even during cold or dry weather, making it an ideal choice or people who want their lawn to look great year round, regardless of the climate. To find out more about our synthetic turn options for your custom garden design, call one of our consultants at (206) 899-1444 today. They can answer any questions you may have, as well as provide a free estimate that requires no commitment from you.